I’ve been waiting and waiting for this one to come out! 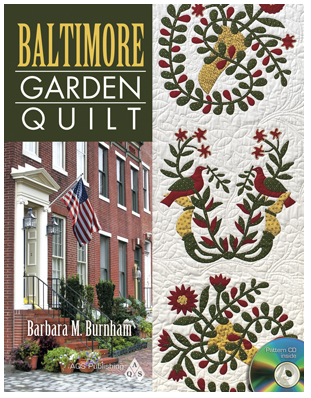 Our featured book this month is Barbara Burnham’s Baltimore Garden Quilt from AQS Publishing. My maiden name is Burnham so I’ve often wondered if Barbara and I are long-lost cousins. After all, Burnham is a good old “up east” name (my dad is from Massachussetts) and Barbara is a charter member of the Baltimore Appliqué Society, but alas we still haven’t figured that out LOL. Today I’m turning the blog over to Barbara to tell us all about her stellar new book. It’s quite something! 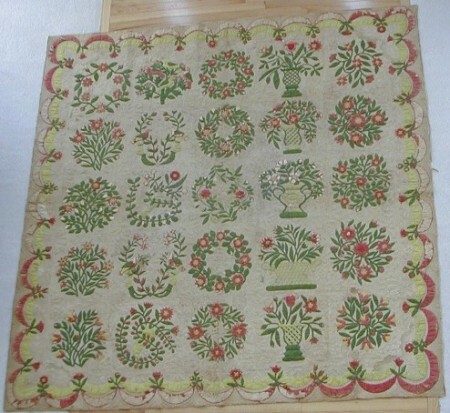 “Flowers on the antique quilt had been stitched on one petal at a time –- one flower had almost 50 petals! But I devised a method of appliqué to do those flowers in layered sections. Over the next ten years, I traced the designs and appliquéd the blocks. (Not that I’m so slow, but also working a full-time job). Meanwhile, my friends at the Baltimore Appliqué Society cheered me on to publish the patterns. I kept a journal noting techniques, drawings, problems, and solutions. I wondered what the original quilter might have been thinking about her world in 1848, and what she grew in her garden to inspire these flowers. Techniques on her quilt include buttonhole stitching, woven baskets, embroidery, inked signatures, and tiny cross stitched initials. Those techniques and more are described in my book using today’s tools and methods. The companion CD includes all the patterns for appliqué blocks, border swags with 40 florettes, quilting designs, alternate sets, and an 1848-era cross stitch alphabet. I asked Barbara to tell us more about the intriguing topic of her appliqué methods. • People who enjoy or collect antique quilts and patterns; Baltimore style quilts, red-and-green quilts, appliqué quilts and antique quilting patterns. • Beginning appliquérs who could learn techniques with a simple tulip block. • Advanced appliquérs who will enjoy the more challenging and complex designs and techniques, or modify them for their own quilts. • Quilters searching for unique border designs and ideas. Thank you, Barbara! All I can say, is WOW. I mean WOW. How much more could an appliqué enthusiast ask for?? Courtesy of the publisher, I have a copy of Baltimore Album Quilt to give away to a lucky reader. To enter the drawing, leave a comment here on this post before 7:00 p.m. California time on Sunday, March 11. The fine print: Contest open to U.S. and Canada mailing addresses only. Do not reply to your email feed; instead, click over to the blog itself and leave your comment at the bottom of the post. Good luck! Please please please! I want that book. Love the “A” word. This book looks like it has great borders. Would love a chance to win this book. Once I started hand applique I never looked back and now enjoy the process of making quilts the old-fashioned way. I am always looking for new tips and tricks to help me. I would love to add this book to my collection. It is a beautiful quilt. And from the description of the book there is a wealth of information as well. Whether I win or not, I will have that book! What an endeavor, 10 years and everything so thought out. How wonderful is she! I cannot wait to read it through and through. I LOVE this quilt!!! I would love to win this book. Thank you for the give-away!! I love that quilt and plan to buy the book IF I don’t win your drawing. It sounds like there are lots of helpful tips and techniques included in the book and I can’t wait to see it. Fabulous quilt. And the table of contents (or the techniques used) sounds like a class in book form. Would love to be the recipient. I want that book (-: looks great. Hopefully I will win ~ otherwise I will buy! What a great giveaway. I would so love to win this book. Kay thank you so much for the chance. This will be a fabulous quilt to make. I would love this book. I love the Baltimore style and am currently working on my own “long term” needle turn applique quilt for my daughter. Here’s hoping…. OH MY! I am going to Lancaster and have this quilt on my to view list. The book sounds very amazing! Can’t wait to see it and visit with Ms. Burnham. The story of her quilt is so special. I just finished making my reproduction of a special quilt. So happy she is sharing the history and the journey! What a beautiful quilt! The books sounds great! Thanks for the giveaway! 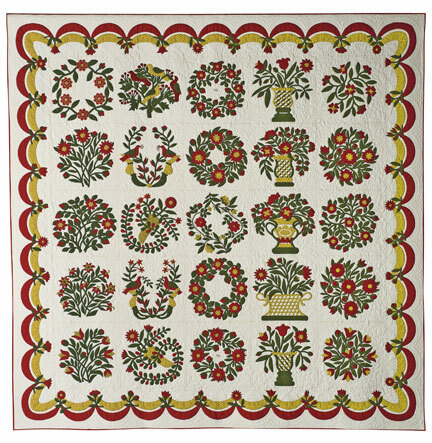 Traditional appliqué – my favorite. I’d love to own this book. A beautiful quilt!! Such a wonderful work, both the original and the ‘rememebered’ versions. I dream of making a Baltimore Album quilt! My favorite quilts are applique. I would love this book. I’ve been drooling over this book since I first saw it advertised! As I’m in the process of designing a Baltimore Album quilt, this is timely! Thank you for the opportunity to win a copy. I hope I do!! Applique is my favorite – I would so love to win this book. I am looking forward to going to Lancaster next week to see this quilt and hopefully to meet Barbara. The original quilt is such a treasure and Barbara has done a great job in reproducing it and sharing it’s legacy. There is much to be learned here! I can’t wait to get a copy of the book! Absolutely beautiful! Can’t wait to start this one. I am just getting up the nerve to do a Baltimore Quilt and think this book would be the best source to have. Thanks for offering us such an opportunity to get it for free. Good luck to all who enter (but personally I hope it’s me who wins….grins). This book looks like a must have. I’m wishing everyone good luck even though I really want to win one. What a beautiful quilt and the book sounds great, as well. Thanks for the giveaway. I just received this wonderful book yesterday.I will donate the book to my quilt guild so that all of the members can enjoy it too! I would love a copy – I already have one with drool all over it, but would like to give one away at the next Applique Society Meeting at end of month. Thank you so much for sharing this wonderful book. I just love the Baltimore Album quilts! I keep hearing about this book and it does sound like a great book.Thanks for the chance to add it to my library. Looks like a terrific book. I didn’t think I needed another baltimore book, but I think I do need this one. I would love have Barbara’s book and to try my hand at her techniques. What a beautiful quilt! Sounds like a wonderful book. Barbara has done so much work on the quilt and book would sure love to have a chance to win this book. Applique is my passion. I would love to win this book and add knowledge to my hobby. Even make some if not all the blocks. Thanks for the chance. Thanks for hosting this giveaway. What a beautiful book! I’d love to add this one to my applique library. Breath taking quilt!!! I would love to read about the journey that this quilt lead! Thank you again for sharing! To view and stitch a BA is to be transfixed by the experience of past quilters. There is a certain mindfulness about it which allows one to see endless possibilities in the stitching process and life. Barbara’s book would be a treasure to own. Thanks for the chance to have this awesome book and be able to create a beautiful quilt. Thanks Barbara for your love and commitment to applique and quilt history. Love it! I applique alot and enjoy it, but I would love to win this book because Barbara did such a wonderful job, and that is mild, she is the expert and if I want to take my applique to the next step this is the book and the woman to learn from. I enjoy talking to Barbara on Facebook, and I like her sense of humor…..if I do not win , I will be buying this book. My quilts are great, but I would like to make a work of art before I die, lololol. All I can say is Wow. Been doing wool applique. Love all kinds, tho. Would love to win the book. I would love a chance to win this wonderful book! Thanks for a great review! Looks like a fantastic book! Would love a copy! Well, the book is on my list to buy if I don’t win this copy. I do so admire Barbara’s work and am in awe of this Baltimore Album quilt. All of the techniques that you used in itself is a wealth of information and to have the patterns as well is wonderful! I would be honoured to win this book! The quilt is fantastic! I would love to make this one as I’ve been looking for a BA that I would really like to make. The book sounds full of terrific information and all the patterns you need. Thanks for offering the contest for the book and for showing this great quilt. What a great post for this wonderful book. Look forward to having a copy, and if I win it here, better still. Thanks for having Barbara on your blog and offering this book, Kay. A gorgeous quilt. Thank you Kay and Barbara. I can’t wait for Lancaster to see the exhibit. I love Baltimores. I am totally fascinated and awed with the amount of work involved in this beautiful quilt. I would like to win this book but I know that in any event, I will purchase it. Thank you for the drawing. I’m quilting my own version of a Baltimore album-not as intricate but it is the lovely red, green and just a little bit gold. I’ve always admired the Baltimore Album quilts and the ladies that put them together. I love applique, but I’ve only ever done it with fusible and my machine, and all my applique projects are done in a day. I’d love to drool over the book for a few months while I collect just the right fabrics, then spend a year or 10 getting the placement and stitching just right! Thank you for the opportunity to win & expand my horizons!! Barbara needs to add another reason to want this book. In addition to it being a stunning quilt I am so impressed by the thoroughness of her research and effort to creating this reproduction pattern. That’s truly an awesome amount of work! Beautiful reproduction of an antique quilt. Would love to have that book. Beautiful book and quilt! I credit to quilt history and study and just as wonderful for applique lovers. This quilt is so lovely. What a nice way to bring the past into the present. I wonder what the original maker would think today of honoring her work by studying hers and reproducing one today. Just lovely! I would love to win the book. If I don’t win, I’ll find it somewhere and buy it. It’s a beautiful book and would make a nice addition to my applique books. this is why I got into quilting in the first place. I have to add that bookl to my collectiona nd make that lovely quilt. I too wonder what the original maker would think if she could see her reproduced quilt. I absolutely love Baltimore Album quilts and so does my husband. This would be a wonderful book to have. Thanks for the opportunity to enter your wonderful giveaway. Oh, what a special book to have. But especially special is Barbara Burnham who took the time to re-create this masterpiece so we could enjoy making it or just to learn the many techniques she has included to help us today. This book was really a labor of love – imagine ten years! thanks for sharing, Kay. what a beautiful quilt! I have been waiting to get a gander at this lovely quilt. I would dearly love to win the book and my dear husband would love for me to win it as it will save him some $$! I may never stitch it or anything approximating it but the tips and techniques will be priceless! Great JOB! Aw, man…I LOVE that quilt!!! ahhh, this is the best of the baltimore quilts! thanx for the opportunity to win this gorgeous pattern book. This book is incredible! Please put me on the list. Beautiful!! Can’t wait to see it! Thanks for the opportunity, Kay. I love applique and work to improve myself each time I attempt a project. I would love to be included in the drawing for this book. It would be great to have in my hands. Thanks so much..
Wow! What a find. That old quilt is priceless and Barbara is to be commended for making it possible of all applique enthusiasts to make such a masterpiece. My fingers are crossed. Thank you Kay, for another wonderful find and great post. I have also been anxiously awaiting this book — I love the red and green Baltimore and this book is such a labor of love. I hope I’m the lucky winner. Thank you for the opportunity to win and for the informative interview. I’m so amazed by Baltimore Album quilts. Thank you for the opportunity to win this book. Oh pick me. I would actually make the quilt !! Thank you so much for a chance to win the book. I can’t wait to read the article about quilting motifs. I know that it will help me improve my quilting. Regards, Grace w.
What a great book! I would love to add it to my quilting library! I’m 89 yrs old so I’ll never get one like this done but you can’t believe how much I would enjoy this book. What a wonderful way to remake history. I wish for a copy of this book and the time to make a quilt such as this. Love that book and would be so happy to win it! Barbara is a very talented lady. Thanks so much for featuring her book! Barbara is an amazing woman and her work is beautiful. I would love to win this book. Nice blog. Thank you for the wonderful book report. Barbara has done a thorough job with this book. I have yet to make “my” masterpiece, a Baltimore Album, would love to win this book ,but if I don’t I will be ordering it for sure! I’m currently looking for my next “personal challenge” and this is it! It is certainly a work of art. OH, MY GOSH! I LOVE this quilt! I would LOVE a chance to win the book!!! Thank heaven for the talented people who take the time to write these wonderful books!!!! Thanks for the opportunity to win a book. Oh what a lovely quilt and what a bonus to get so many techniques AND a pattern CD too! Needless to say, I want one!! What a stunning quilt! I would be very honored to win a copy of the book. Love the colors and techniques shown. I would love to win this book! I am currently working on a BA style quilt. It sounds like Barbara has many great tips to share in her new book, along with the patterns. I think this is an absolutely stunning quilt and I admire the dedication it took to recreate that quilt! I think “WOW!!!! !” sums it up. To win this book would be an honor and,hopefully, I will be able to do justice to the pattern in my own way. What an enormous undertaking to write a book like this, and to make the quilt. It looks fantastic. Stunning! Congratulations and thank you for producing a copy of this fabulous piece for us all to love and create. Thanks for a chance to win this book. The quilt is beautiful, and I would love to own a copy of the book to make my own quilt. Congratulations Barbara – What a labour of love! I too have a passion for gardening and quilting, somehow I think they really compliment one another. would love the win the book… Baltimore is such an awesome place and I have always wanted to do a Baltimore Album styled quilt. Thanks for the giveaway. What a wonderful accomplishment! The quilt is gorgeous and I’m sure the book is equally well done. A chance to win this book and create our own version is something to look forward to. Thank you for all your hard work, Barbara! Oh I would so love to win this book. Applique is my passion and I would love to do this project! and would love to win the book and get started on making this quilt. Thank you for the chance to win this awesome book. Thank you for hosting the giveaway. I have found your books very helpful as I work on learning and improving applique skills. I’d love to win it! Thanks so much. Kay, Thanks so much for having Barbara tell her story of this quilt. I am so glad she found it and has brought it back to life. Lovely post, thanks for having the give away. Thank you, Kay, for giving us a chance to win this magnificent quilt book and most of all thank you, Barbara, for the perserverance in making this possible! OH! To be in the right place at the right time to find such a treasure of a quilt! Congratulations for you incredible handling of this gem! Thank you, Barbara for sharing! Great article! As a needleturn enthusiast I am always fascinated by learning how others do applique and this book sounds very interesting. The cover alone draws me in!! What a great quilt! love the interview and thanks for the giveaway! This looks like a wonderful book to learn more about this fun hobby . Sounds like it would be interesting to read just for her thoughts while making the quit. Thanks for the chance to win one. What a stunning quilt. thank you for all your work in honouring the quilter and her work. I am new at applique and as poster Susan said find it both relaxing and addicting. Thank you for offering this book as a giveaway. I really want to own this book and read all the techniques Barbara used. I think it will truly be a complete applique education. Love this posting and the quilts are stunning. What an awesome find! Love your book too! Beautiful quilt! Wow, ten years of work. Thanks for your perservance! Would love to have this book. wow! there is a lot in that book. If I don’t win one I am going to have to buy one for sure. thanks for a chance to win one. I have this book but now trying to find the fabrics. Can anyone help? An absolutely stunning quilt! Thank you for the chance to win this gem. I’ll definitely buy a copy if I don’t win!